Our group of 24 arrived at Nav Gurukul energized by a spontaneous half an hour of intense dancing in the bus. As we gathered in front of a green 4 story building, we were welcomed by a group of girls – students of Nav Gurukul – with heartwarming ritual. Each of us receiving a sweet and a bindi on our foreheads. We walked up to the third floor into a small room with no furniture. There was only one projector and a laptop on the floor. Our group already filled the room so only one of the girls entered to make a presentation. She closed the door behind her and the room got dark and filled with cinema like anticipation. Without saying much, she played what seemed to be a video. In the video, the Nav Gurukul text would spin and leave a trace that would draw something. After the first sequence, the video unexpectedly stopped. Our presenter was confused. She played the video again and it stopped at the same point. She opened a code file that was generating the video, looked for something and made a change. She played the video again and it stopped at the same point. As she was going back and forth from the code to the video, we could feel the the tension building up. Each time she would play the video again, we would be “on our toes” , holding our breaths, like fans of a football team who’s favourite player is about to score. Our heroine did not give up and finally the video worked. We were thrilled, as the last sequence of the text “Welcome to Nav Gurukul” was completing its dance on the screen. I left the room charmed by this little moment. The whole group floated to a nearby temple where all of us and all of the students could gather in the shade. Each of us introduced themselves by saying the name, where we come from, a thing we like to eat and one thing we are grateful for. 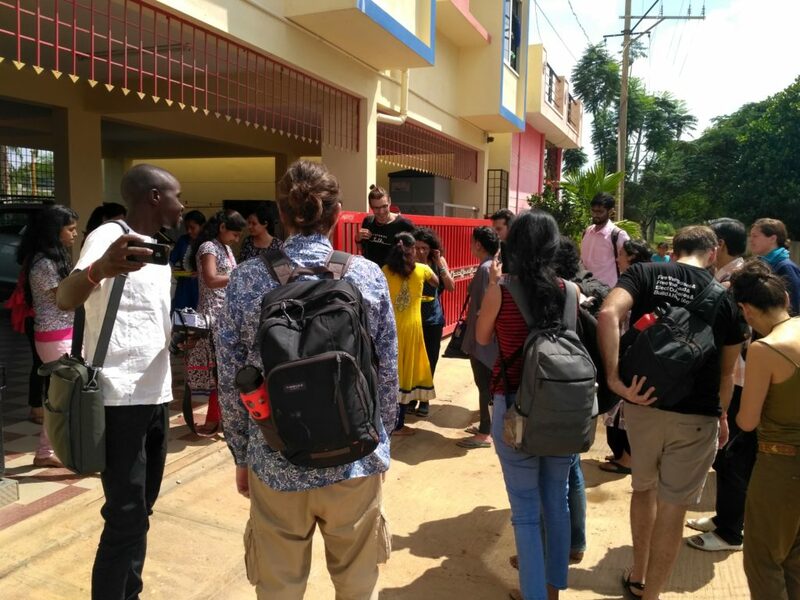 The twenty four of us were visiting from places like Jordan, Canada, Uganda, Germany, California, Mexico, Thailand, Romania, Cuba and of course India and the girls came to the school from all over India. Most of the girls were grateful to a parent or a sibling and to NavGurukul. After the introductions, our hosts sang a song for us and we spontaneously reciprocated by singing our own song. We were bad at it but it created even more cheerfulness and familiarity. Next we did a little game that resulted in teams of 4 hosts and 2 guests that would go around for two hours to explore and find out more about NavGurukul. 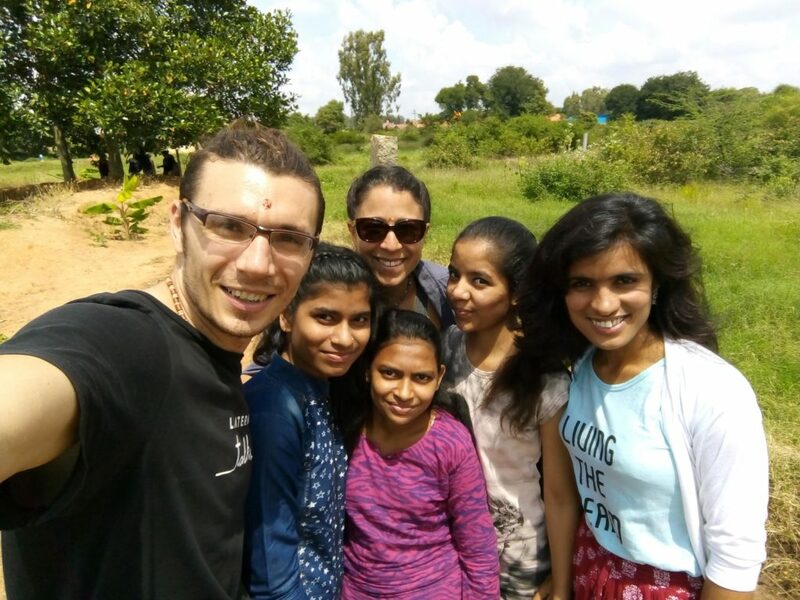 Our group went for a walk to a nearby lake, eate local fruits from the trees, took lots of selfies and learned about this one of a kind school in the outskirts of Bangalore. Basically, NavGurukul is a one-year residential program where girls from modest or disadvantaged backgrounds learn to code up to the point where they can get a job or become freelancers. There is also a campus for boys. There are no teachers. They have an online platform with weekly practical projects and some tutorials. What they call “classes” are time slots for working on the projects. If you don’t know something, you google search, you watch tutorials or you ask your peers. You can also ask the two founders who are software engineers and play also the role of mentors. The girls go to buy the vegetables from the market and they cook their own food and generally self-organize everything. They elect a treasurer to take care of the budget or a hygiene coordinator to organize cooking and cleaning. The girls are generally around 17 years old and there is only one other adult living with them who’s role is that of a facilitator. She is 22. As we were going around the lake, we also learned that they will move from that building soon. There are boys in the village nearby that keep bothering and harassing the girls. To answer this situation, they organized “fearless walks” in the village, contacted the police and more but eventually, they collectively decided that they should move. They also decided that although they are leaving, they want to stage a play in the center of the village to raise awareness about the lack of safety for girls. Before we joined the closing session, I asked two of the veterans of the school who were around for the past nine months for an interview. Here is NavGurukul in their own words. Why did this visit to Nav Gurukul touched me so much? The Yatra could not have come at a better moment for me. 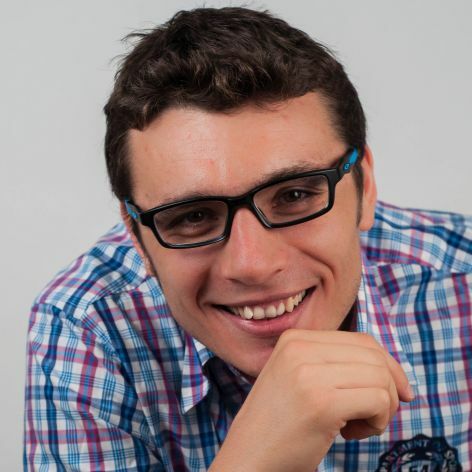 After co-founding The Alternative University in Bucharest and being part of its core team for 8 years, in 2015 I started a learning journey to visit projects around the world that aim to reimagine higher education. I traveled non-stop for 22 months, visited more than 100 projects in 19 countries and then I went back to Bucharest to write “the book”. A year and a half passed before I could find the place, the energy and the resources to write. By that time, the spirit and the inspiration of my 22 months journey was a fading memory. I expected that the yatra would bring back the spirit and inspiration for the book. The book is going to be about the possibility of a worldwide university self-governed by its own students. From the many projects I visited around the world, Nav Gurukul is one of the gems in terms of students self directed learning, peer learning and self-organization. 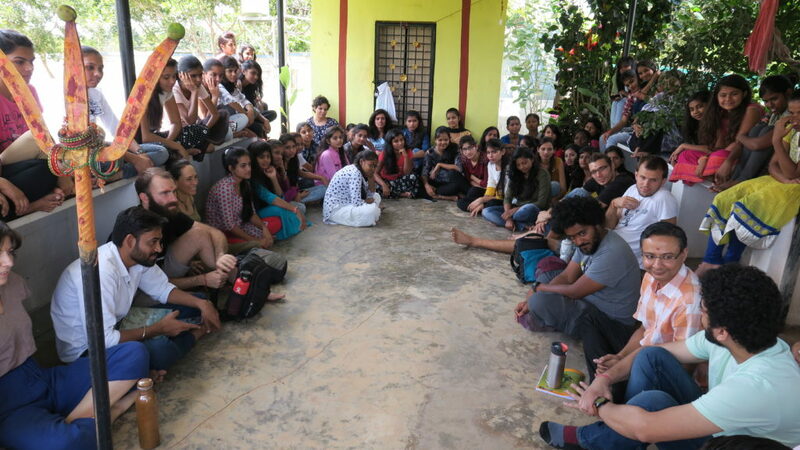 The visit to NavGurukul happened in day 3/8 of our alternative education pilgrimage from Bangalore to Auroville. 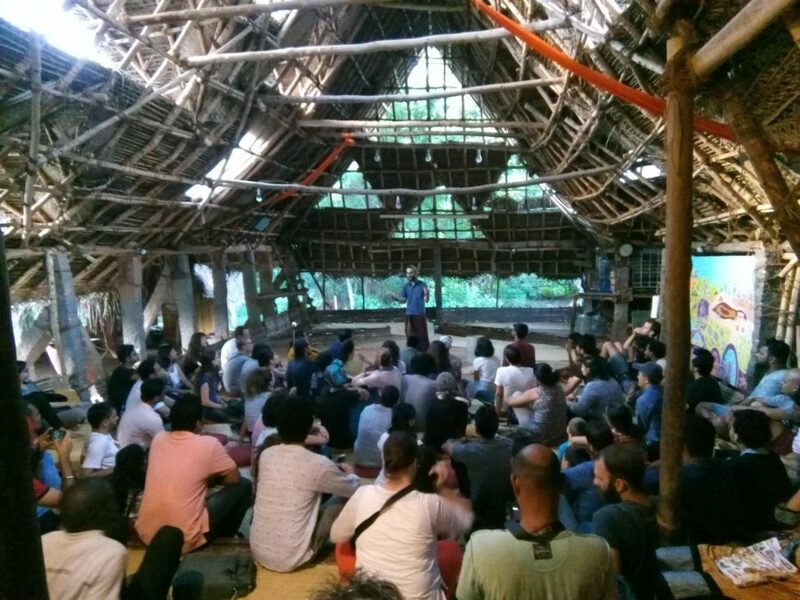 The yatra followed the global gathering of Ecoversities Alliance, a friendship of radical alternative universities from around the world. Most of the group was formed by participants to the global Ecoverstities gathering and the places we visited were either part of the alliance, or friends or close to its spirit. Bhoomi College’s core consists of two fellowship programs: one in sustainable living and the other in holistic education. In their own words: “Bhoomi College is committed to joining the younger generation to co-create meaningful and empowering learning environments to address challenges in both education and sustainable living. 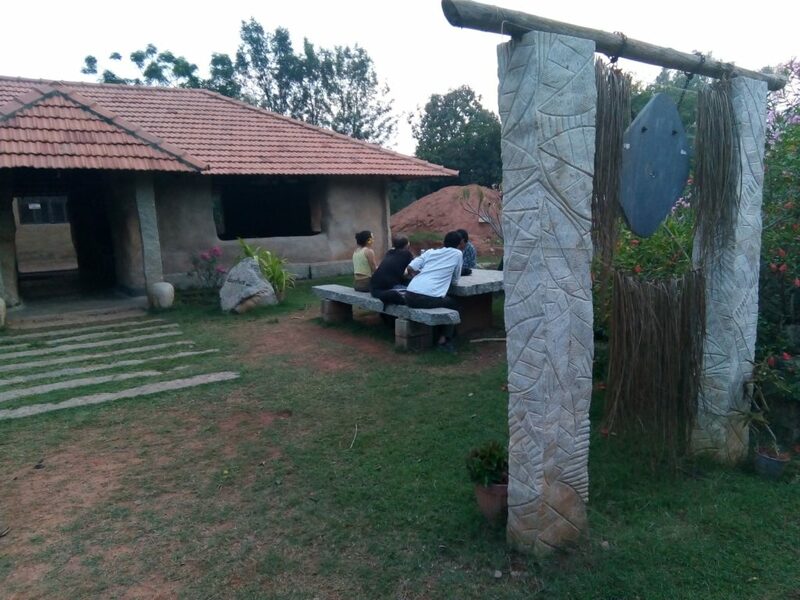 Bhoomi believes in supporting learning for different kinds of people – hands-on, interactive and collaborative, intellectually rigorous, project-based, self-initiated and more.” In our short visit at Bhoomi I was impressed by the architecture: simple, with natural materials, beautiful. It reminded my how much the character of a space can support its power to nurture transformative learning experiences. Srishti Institute of Art, Design, and Technology is a non-residential institution founded in 1996 with the objective of providing art and design education in an environment of creativity to maximize the individual’s potential. It is a formal institution in the sense that it is accredited, offers degrees and it has full time faculty but they seem to be stretching that framework to its limits in order to provide as much creative freedom for their students and faculty. It was an inspiration as an intersection of the formal framework of a university with a diverse collective of artists and designers and wannabe artists and designers who seem to share their intense passion for their craft. Project DEFY is an initiative to start “nooks” in rural communities. What is a nook? It a makerspace that is actually intended to disrupt education by creating a learning space with no teachers, where people self initiate their learning projects. The word is derived from the hindi word nukkad which is “that corner of the street where people gather in their free time“. DEFY means “Design Education for Yourself”. I was inspired by the freshness of their approach and their way of starting the spaces, not giving much instructions and not teaching and handing the spaces over fast to the communities that form around them. 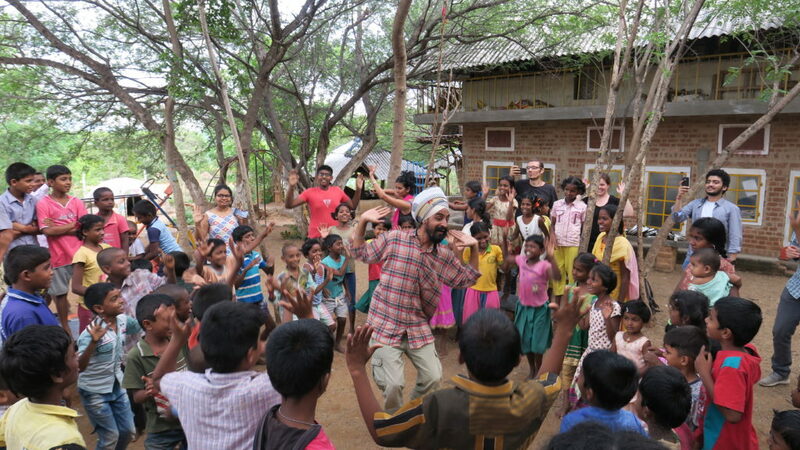 Auroville, Pondicherry – Sadhana Forest “is a volunteer-based organization focused on reforestation and food security in arid areas. The vision of its founders, Yorit and Aviram Rozin, is to transform 70 acres of severely eroded, arid land on the outskirts of Auroville. In a spirit of human unity, their aim is to introduce a growing number of people to sustainable living, food security through ecological transformation, wasteland reclamation, and veganism.” What stays with me is the feeling of living in the forest in all natural buildings, with little electricity from the solar panels and the conversation I had with a volunteer that came for two weeks and became passionate about the project and stayed for more than a year. Swadharma (Auroville, Pondicherry): The Swadharma program is a 5 week program that uses Auroville as its campus and playground. It defines itself as “a response to the call for an education for our times. It offers young seekers – age 18 to 28 – the opportunity to embark on a transformative learning adventure with the goal of self-discovery.” Some of its key words are deep listening, yoga, spirituality in daily life. Some of its features are daily journaling and sharing circle, knowledge sessions in the morning, time for micro-projects, weekly presentation of their learning journeys and a final presentation at the end. Anveshan (Auroville, Pondicherry): organizes yatras (=learning journey or pilgrimage) along the course of the Ganges river. It is a platform to “take youth out of books and into the real world” and have the opportunity to descover yourself and the outer world. It is an intense journey where people “either break-down or break-through”. The river is used as a methapor for one’s life. 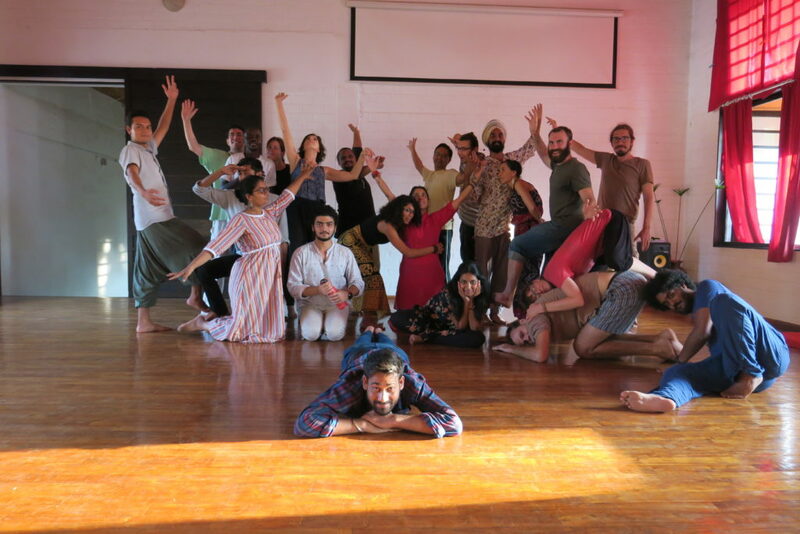 The participants are a balanced group of youth from Auroville, from the bioregion around Auroville and the wider world. The pedagogy is base in integral education as defined by The Mother, one of Auroville’s founders, Kolb’s experiential learning cycle and The Conscious Full Spectrum Response model designed by Dr. Monica Sharma. Faced with a place that is so complex, different and controversial our group of 24 was becoming enlivened with debates and different perspectives. 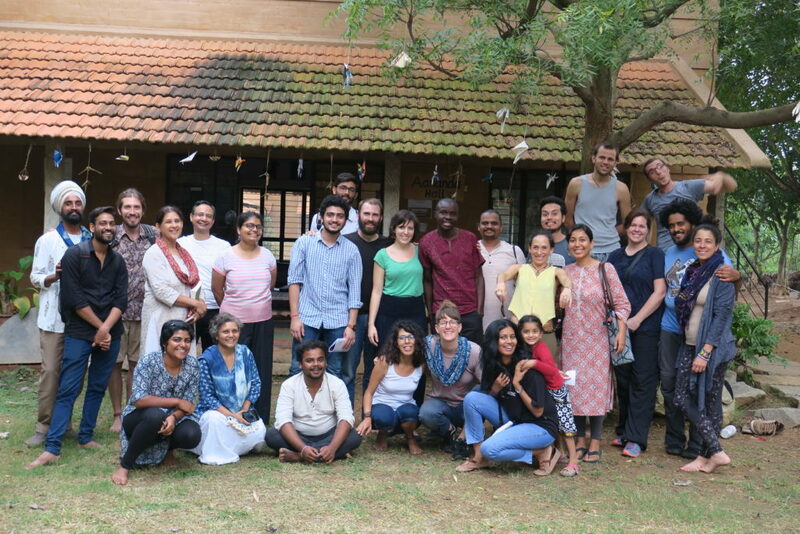 By the time of our last day in Auroville, our group felt familiar and our learning together shifted gears. This was to be also the last day of our yatra so Harsh invited the group to design a reflection and closing process. Our reflection process ended with a group “snapshot” of how we felt. 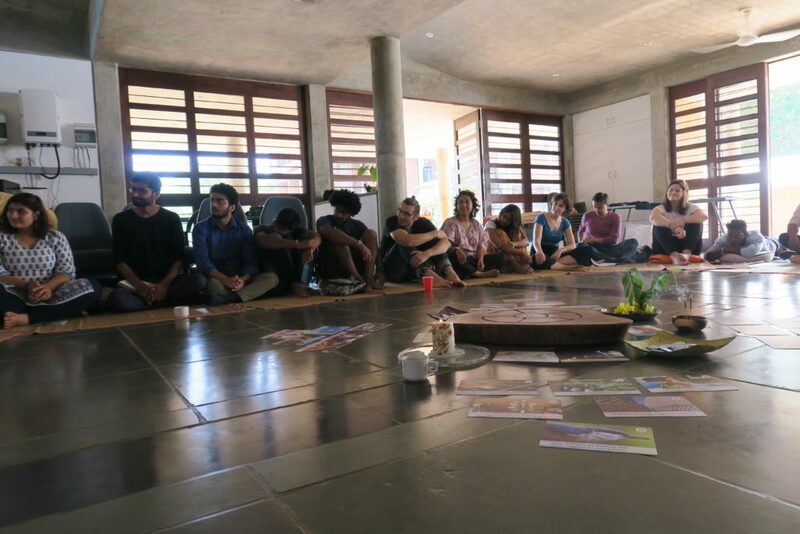 For me, this Yatra was the kick-off of an exciting idea: the Ecoversities Alliance playing the role of an “ecoversity” for the co-founders, organizers and facilitators of alternative universities. It is a powerful way to refresh your thinking, your practice or your motivation but also a way to weave a fabric of relationships around the world that will be the invisible structure for the global process of reimagining universities and humanity’s knowledge systems. 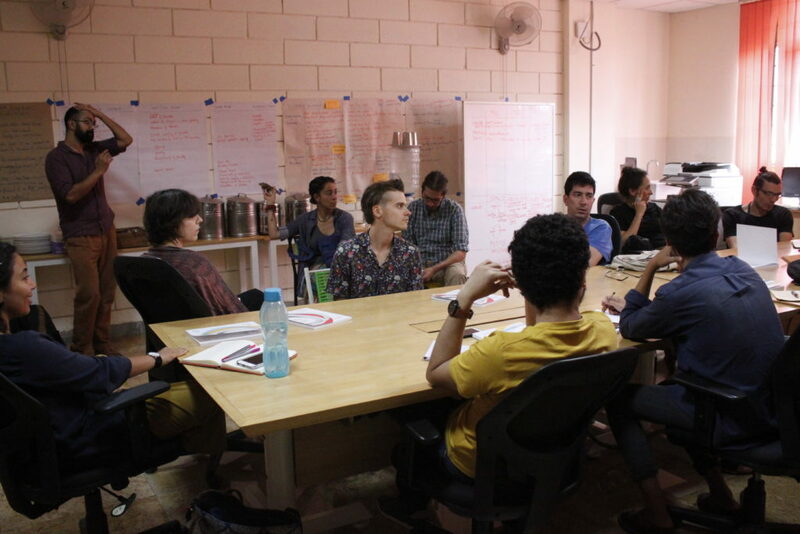 It is the second group learning journey that I’m part of in the context of Ecoversities Alliance, after the one in Mexico, and it creates the feeling that I’m part of an organic co-learning process that build its rhythm and momentum. This entry was posted in Miscellaneous on November 7, 2018 by Traian Bruma. There must be more than 3 million schools in the world and many more educational programs, libraries, makerspaces, learning communities and other setups where learning is intentionally nurtured. We will refer to all of them as “schools”. So, if you are a learner that wants to design her own university, a learning designer, a teacher, a parent, a school principal or an entrepreneur … how do you find the schools that can be a source of inspiration and learning? In the context of the Schools Around The World project, we have our first challenge: find too many cool schools. I’m dropping here some quick ideas for the starting the search and an invitation to help improve this. Go through some articles about your specific topic and try to find examples of schools and search terms. Some nice places to start could be Edutopia or MindShift. hundred.org/en: a list of 100 global innovations carefuly selected and curated; Wonderful! Please post your suggestion as a comment. This entry was posted in Miscellaneous on November 17, 2017 by Traian Bruma. This entry was posted in Miscellaneous on November 4, 2017 by Traian Bruma.